Less than a decade ago, Timothy Cornelius, the head of the tidal-power venture Atlantis Resources, struggled to get investors and regulators to return his calls. Now, as he formally unveils the world’s largest tidal-stream project under construction, he can hardly fend them off. “The level of interest has been almost unmanageable,” Mr Cornelius complained happily of the requests for visits and meetings. The interest reflects the importance for the nascent tidal sector of Atlantis’s 398MW MeyGen project between the Scottish mainland and Orkney Islands. Success will demonstrate that tidal power has finally become a serious option. “There is no doubt that the eyes of the world are on this project,” said Nicola Sturgeon, Scotland’s first minister, ahead of a visit to the Nigg Energy Park on Monday to see Atlantis unveil the first turbine to be installed under the waters of the Pentland Firth. The hulking device, which resembles a bulked-up wind turbine, is one of four with combined output capacity of 6MW that make the up the £51m first stage of the MeyGen project. If all goes well, they will be sending electricity within weeks to a new power conversion unit on the shore of the Pentland Firth at Ness of Quoys from where it can be sold to the grid. “It is possible to consider the first sparks will come in late October,” Mr Cornelius said, adding that a second batch of 4 turbines will follow immediately. The second stage will much cheaper and will require less public investment and the third should need none at all, according to Atlantis, which in April announced a deal with Equitix under which the infrastructure investor plans to put more than £100m into Scottish tidal power over the next two years. The project still faces formidable challenges. The very currents desirable for electricity generation complicate installation of the turbines, each of which requires more than 1,000 tonnes for their structure and ballast. “The Pentland Firth is a nightmare for most mariners,” said William Bremner, a skipper on the ferry that runs from nearby John o’Groats. Most work on the undersea site is limited to short periods of slack in the current, particular during smaller “neap tides” twice a month. Yet the appeal of tidal stream power is clear. There is less impact on the landscape or wildlife than offshore or onshore wind farms. And, unlike wind, output is predictable years in advance. Australia-based Atlantis, which is listed on the London’s Stock Exchange’s Aim market, plans to spend nearly £500m in tidal power in Scotland over the next two years. Mr Cornelius said the Scottish and UK governments are right to see tidal stream as a major opportunity. Three of MeyGen’s first batch of turbines are supplied by Germany’s Andritz Hydro Hammerfest and a fourth is being built for Atlantis by Lockheed Martin of the US. But more than 40 per cent of capital expenditure for the first phase is within the UK and this will rise in the second phase to 60 per cent. Atlantis hopes to be able to firm up plans for at least 50 turbines next year, enough to turn Nigg into a centre for fabricating, assembling and testing. “Britain lost wind turbine manufacturing [and] Britain lost nuclear manufacturing, but it can own tidal,” Mr Cornelius said. REMOVED FROM THE DAILY MAIL THIS IS MONEY WEBSITE - BIZZARE! The world’s first major tidal energy project – a £1.6 billion underwater farm of 400 turbines off northern Scotland – has been given the go-ahead by the Crown Estate. When complete in 2020, the Pentland Firth project will generate enough electricity for 400,000 homes. It will also provide employment for hundreds of former nuclear workers at nearby Dounreay who will make the 100ft high double-bladed turbines. 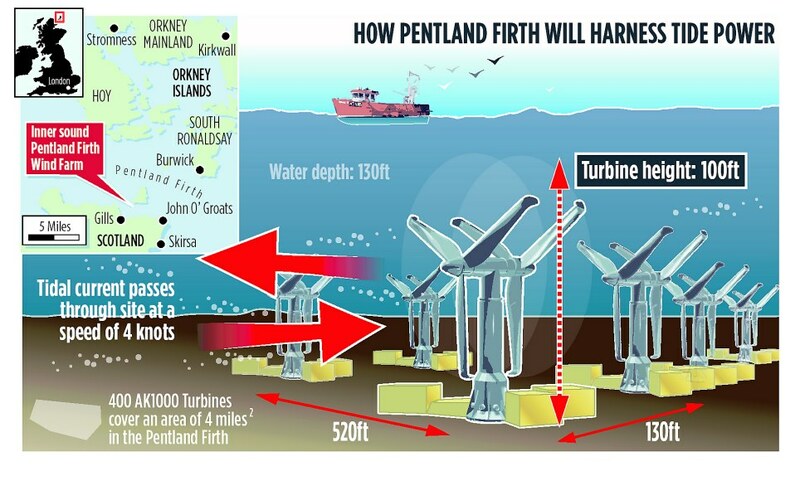 There are further plans to exploit the Pentland Firth over the next two decades, installing 1,000 turbines that will generate 1.6 gigawatts of energy, enough for more than a million homes. The decision by the Crown Estate to offer the lease to the MeyGen consortium is regarded as the most significant investment in tidal energy so far. MeyGen is a joint venture between International Power (45 per cent), US investment bank Morgan Stanley (45 per cent) and Singapore tidal company Atlantis Resources (ten per cent). Experts have dubbed the Pentland Firth the Crown Jewel of marine energy sites because the tidal waters there are among the fiercest in the world. Water flows at just over four knots, allowing each of the huge structures to generate one megawatt of energy without significant interruption. The turbines will be lined up 175 yards apart, weighted down by scrap metal. As the water depth in the Pentland Firth is about 130ft, small craft will be able to sail over the area of about four square miles. Vessels with a draught of morethan 32ft are automatically routed round the north of the Orkneys. Because the waters are so rough, little fishing takes place and there is no danger to fish life as the blades revolve so slowly, say experts. The turbine farm, which will be clearly marked on charts, is well away from sensitive military areas where Royal Navy submarines operate. The turbines will be built at new factories near Dounreay. A prototype designed in Britain by Atlantis and built in Newcastle upon Tyne has been operating off the Orkneys for the past two years. As the Crown Estate owns the seabed around Britain, it will be paid hundreds of thousands of pounds a year in rent for the turbine scheme. The Royal family, which will soon benefit by taking 15 per cent of the Crown Estate profit, may also be able to enjoy renewable energy from the Pentland Firth project. The royal Castle of Mey, which Prince Charles visits every year, is a few miles from the tidal farm site, which lies between the Caithness coast and the island of Stroma. Sorry, it's not that simple. 3,200MWe capacity represents about 2560MWe on average. so at 1.6MWe per turbine that's 0.96MWe on average. English Channel also have good tidal stream potential. ...and still probably cheaper than new nuclear! Trident and other nuclear-related programmes. I think that reality also exercises political minds. Nicola Sturgeon addresses think tank in Washington. Its a pleasure to be here in the United States, in Washington DC and of course here in this well respected organisation. One of the things I’ve often been reminded of since I arrived, is the fact that the very bonds between Scotland and the USA go back centuries. They run from the discussion and debate between enlightenment thinkers such as David Hume and Benjamin Franklin; to the modern exchange of university graduates and the connections between our technology companies. Our relationship is cultural, social, historic and economic. We value those things very highly. And from what I’ve seen on my visit, I’m sure that those ties will continue and strengthen for generations to come. So it’s a pleasure to be here at the Council on Foreign Relations – an organization which for more than 90 years has contributed to that exchange of ideas between the USA and the wider world. And I’m especially pleased to be speaking at this particular time. I’m very aware that there is a strong interest here in recent political developments, not just in Scotland but in UK as a whole - and in the implications of those developments for Europe and the wider international community. Before we begin our discussion, therefore, I want to briefly provide my thoughts on where the UK and Scotland stand now. And in doing that, I’ll talk about two referendums and one election. I shall look back at the referendum on Scottish independence last year, and the UK General Election last month; and I’ll also look forward - to the referendum on the United Kingdom’s membership of the European Union, which will take place sometime before the end of 2017 – although the exact time is yet to be determined. Now, as you’ll probably all be aware, the first referendum - on Scottish independence in September –didn’t exactly turn out as I would have wanted! But while it may not have transformed Scotland's constitutional position, it did undoubtedly transform Scottish and had a transformational effect on UK politics as well. Firstly it made Scotland one of the most politically engaged countries in the world. Nearly everyone became involved in a peaceful and passionate debate about the kind of country they wanted to live in. That has had lasting consequences. For example in the UK General Election last month, turnout in Scotland was 5 percentage points higher than in the rest of the UK. Many people, who maybe hadn’t previously been interested in politics, understand that their vote and their voice really matter – they feel involved in decision-making in a way which hasn’t happened before. And so regardless of the result, the referendum itself has been good for Scotland – we are more energised, informed and empowered than we have ever been before. The result from that referendum also provided part of the context for last month’s UK General Election. To the casual observer the UK election produced a very clear result, with the election of a majority Conservative government, and saw David Cameron remaining as Prime Minister. But when you look in more detail, something striking and more complex emerges – in many ways there were four different elections last month in the different nations of the UK. Those elections had very different results and those results have significant implications for the UK and how its governed as a country. The Scottish National Party won 56 seats out of the 59 in Scotland; Labour were clearly the biggest party in Wales; the Conservatives gained 60% of the seats in England; and Northern Ireland has always had a different system of party politics. Shortly before the election I raised the question of what is an electoral mandate in the UK when the four nations are pulling in different directions. In practical terms simply winning enough votes and seats in England, can secure a Parliamentary majority. But when a government is achieved only by winning seats in one of the four nations of the UK - what kind of mandate is that? The Conservative Party has the right to form the Government of the UK. But it was not the biggest party in three of the four nations of the UK – far from it - and so the legitimacy of its actions in those other nations comes very clearly into focus. And so as I discussed with the Prime Minister when he came to see me after the election - what happens to the future of the UK in the years ahead will depend on how responsibly Westminster deals with that reality. I'm not planning to refight the independence referendum on the immediate horizon - but if the UK is to remain intact it must adapt to multinational and multi-party politics in a far more substantial manner. Here in the USA, you’re used to the idea of 50 different state governments making very different choices about very significant issues. But that’s not something the UK governments are used to – for much of the last century, it’s been a remarkably centralised state. And it’s now increasingly clear that for the UK as a whole, one size doesn’t fit all. And a one size fits all approach will not fit the bill for the future. The distinct political identities which seem to be emerging in different parts of the UK, are also relevant to the third vote I want to talk about – the coming referendum on the UK’s membership of the European Union. It’s also a matter of considerable interest here in the US too. What I find odd about this referendum is that the Prime Minister says that he wants to stay in Europe; both of the biggest UK parties want to stay in Europe; there’s overwhelming support – or so it seems - for the EU in the Westminster parliament; and yet David Cameron has us standing perilously to the exit door to appease members of his own party. Many of them will not be happy with any renegotiation of the UK’s terms of membership, and will campaign for an “out” vote regardless. The UK Government’s approach seems especially odd in Scotland. In last month’s general election, across the whole of the UK, parties which want to leave the European Union got more than 12% of the popular vote. In Scotland, the figure was less than 2%. Only this week, an opinion poll of Scottish voters has shown that 72 per cent would vote to remain in the EU, with only 28 per cent saying they would vote to leave. This is not surprising given the economic significance of EU membership. In Scotland alone, 30,000 jobs relay on exports to the EU. So a referendum simply isn’t a priority for most people in Scotland. But it is possible – depending on how the result goes across the UK – that Scotland could be forced out of the EU against our will. That’s why the European question is in some ways directly linked to the question of how the UK is governed. One of the things that Scotland was consistently told, in the two years leading up to the independence referendum, is that we are a valued and equal partner in a UK family of nations. And so surely it shouldn’t be possible for Scotland’s voice to be overruled in an EU referendum. That is why the Scottish Government is arguing for a “double majority” provision in that referendum – where the UK can only leave the EU, if each nation of the UK votes to leave. That sort of territorial requirement is used in federal countries such as Canada or Australia. It’s time to apply it to the UK - which is a multinational state – to give meaning to the views that the UK is a family of nations. I said last week, in a speech to the European Policy Centre in Brussels, that if Scotland were taken out of the EU against our will, the groundswell of opinion in Scotland could produce a clamour for another independence referendum which may well be unstoppable. The UK Government can remove that possibility at a stroke by agreeing to the 'double majority' provision. The referendum legislation should demonstrate what we have so often been told – that the UK Government sees the UK as a family of nations. It’s clear from what I’ve said that these are momentous and exciting times for Scotland and indeed for the UK as a whole. That brings challenges – of course – but it also brings considerable opportunities. The coming months and years give us a chance to secure greater powers for Scotland - allowing us to build a powerhouse economy and ensure a more equal society; they provide an opportunity to secure better governance across the whole of the UK; and they will see a vote that I hope will reaffirm the place of Scotland and the UK within the European Union. All of those outcomes are possible, but none of them are guaranteed. They require positive argument and constructive negotiation from political leaders across the UK. I’m determined that the Scottish Government will take the lead in making those arguments and contributing to those negotiations. Because if we achieve those three objectives, it will be good for Scotland and indeed for every nation of the UK; it will secure our place in Europe and the wider world. By doing that will help us to strengthen our friendships and alliances - both here in the heart of Washington, and right across the world. Two turbines in the Pentland Firth set a world record for monthly production from a tidal stream power station, according to the project's developer. Atlantis said there had been "minor delays" in receiving upgraded components for the third turbine, but hoped the device would be reinstalled at the site next month. David Taaffe, director of project delivery at MeyGen, said: "The production performance from the installed turbines on the MeyGen project has been very good. "August proved to be a world-record month, providing enough energy to power 2,000 Scottish homes from just two turbines." She said: "The tides that flow through the Pentland Firth are some of the most powerful anywhere on earth and harnessing them has meant using machines and skills which have never before been tested on a commercial scale. "This latest record is just one in a long line for the MeyGen project, which is leading the world in tidal energy deployment." Energy Minister Paul Wheelhouse said: "It's great to see Scotland's world-leading marine energy sector continuing to make headlines. "Phase 1A of the MeyGen tidal project, built with financial support from the Scottish government, has surpassed expectations. "Two turbines alone produced enough energy during August to power around 2,000 homes - believed to be a world record for a tidal power station."